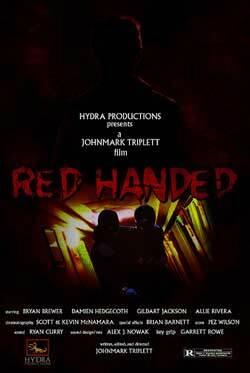 Darlings, tonight’s horror short is Red-Handed, a 2011 tale of burglary gone wrong. While it’s true that a mysterious mansion may be full of rare artifacts, perhaps these ill-fated thieves should have asked themselves what dark force first collected such wealth…and what sinister measures it might take to protect its treasures. Enjoy! If I was in that dude’s apartment I would find something better to steal than a friggin’ wicker soccer ball!